Here are our top 5 plate storage ideas that will help you create better access and organisation of plates and crockery. 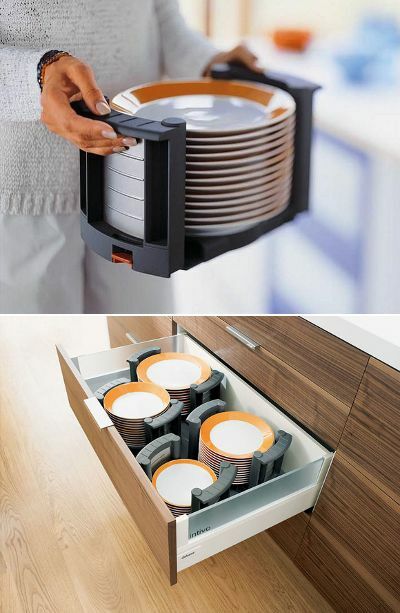 Everyone has plates in their kitchen storage and we all need somewhere to store them. For the majority of us, we stack them one on top of another. 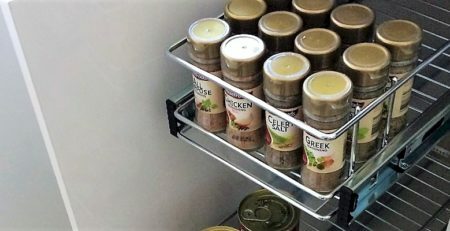 But there are a variety of ways to store these everyday necessities to make them more accessible. 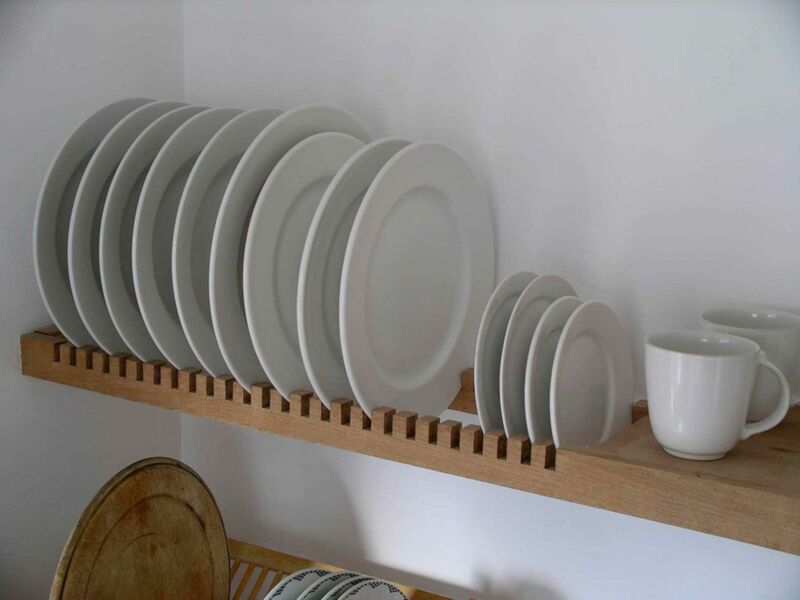 If you currently store your plates on a shelf (behind hinged doors), consider adding a pull out plate rack. They can be fitted into new and existing cabinets, so no need embark on expensive renovations. 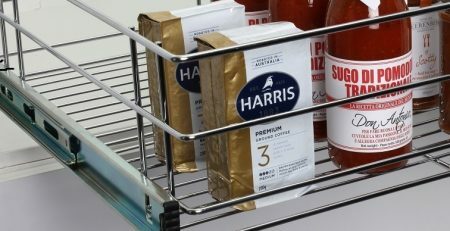 It’s a space efficient solution and best of all it makes your plates perfectly accessible and visible. The slide out tracks hold up to 40kgs so provide plenty of strength. This plate storage idea is Do-It-Yourself friendly so great for a weekend improvement project. 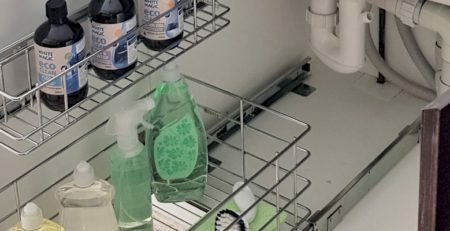 If you have an existing drawer and need a better way to move your plates around, the plate holder can be a good solution. It comfortably allows you to hold several plates at once. The plate holder sits within a drawer alongside others, ensuring plates are stored securely. 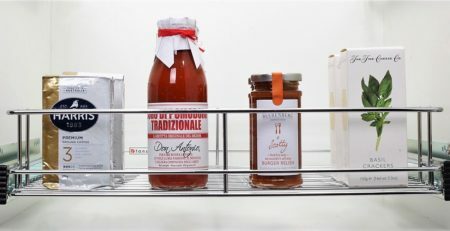 It is easily transportable from drawer to table. 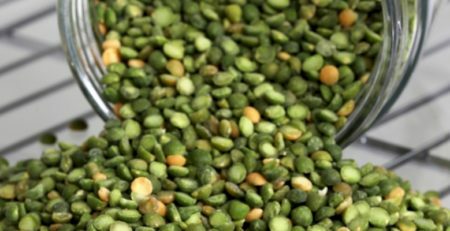 There are many types and brands on the market, so shop around because prices vary greatly. If you’re opting for a less expensive option, be sure it’s sturdy and can hold the weight. These boards stack multiples of plates together in a drawer and are held securely with pegs so they don’t move around. 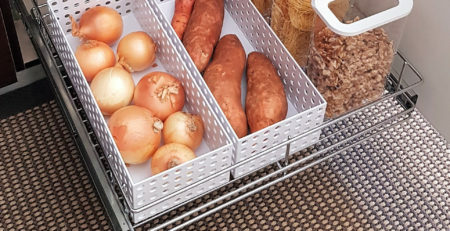 It can be a great way to organise a large or wide drawer. The peg position is flexible so it’s a easy way to organise the space. Peg boards can also be added to existing drawers (not made of wood, as is pictured). 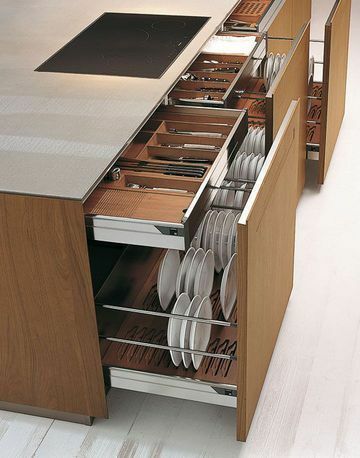 If budget is not an issue, these dedicated plate drawers are impressive! 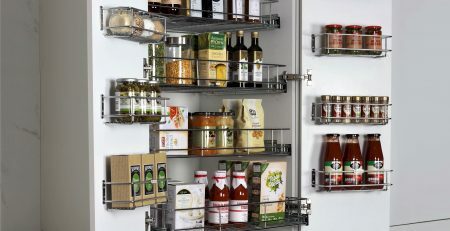 They optimise the kitchen storage space and offer great functionality. Be sure however that you stick with standard plate shapes to ensure you make the most of the space and specially routed grooves. 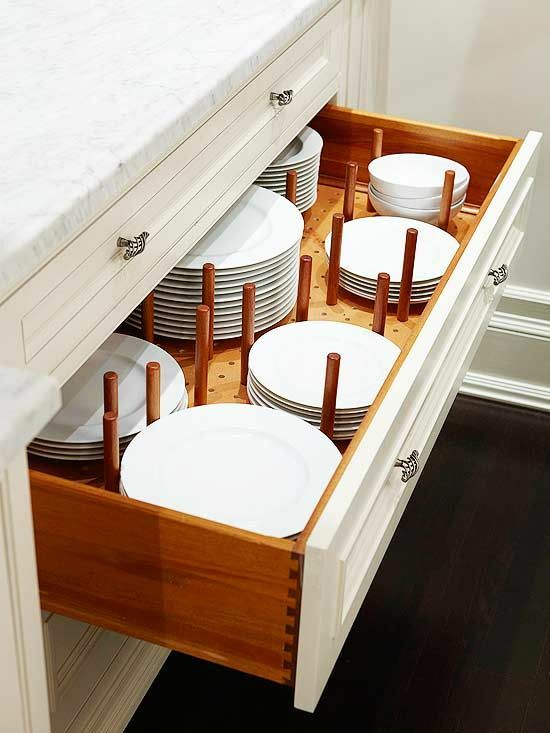 These drawer systems offer great storage weight capacity and can be ‘heavy duty’ if the drawer is very wide and you plan to store a lot of plates. 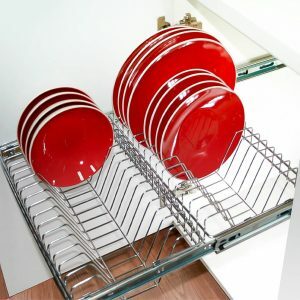 Store your plates efficiently in an open shelf or over the sink. Individual dividers ensure plates are stable and prevent the crockery from moving/breaking. A beautiful shelf can also be a feature on your wall. 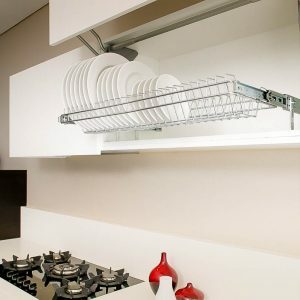 If you need to conceal your plates, this slide out plate rack is designed for overhead cabinets (or shallow cabinets). It fits into a wide range of spaces because it can be bottom mounted. Installation is easy, so great for converting existing cabinets. If you would like more information or advice on ways to store your plates and crockery, please contact us. 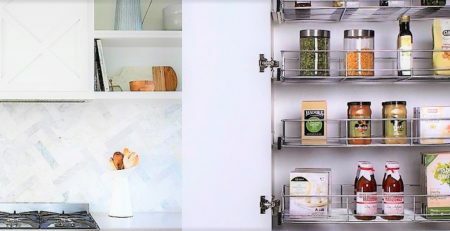 Our Facebook pages and Instagram have regular tips and inspirations for kitchen storage and other areas of your home.